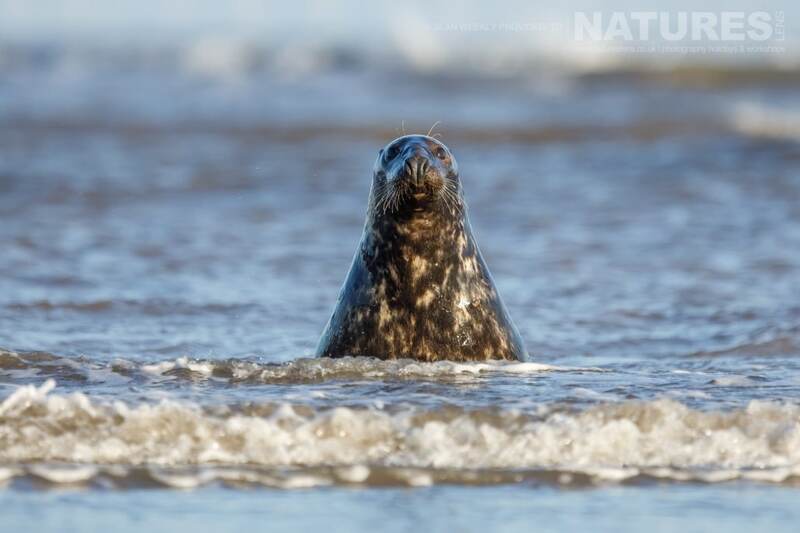 During the first week of the NaturesLens Grey Seals of Lincolnshire photography holidays, Sean took the group out onto the sandbanks at low tide where they were able to capture images of the seals in the surf. 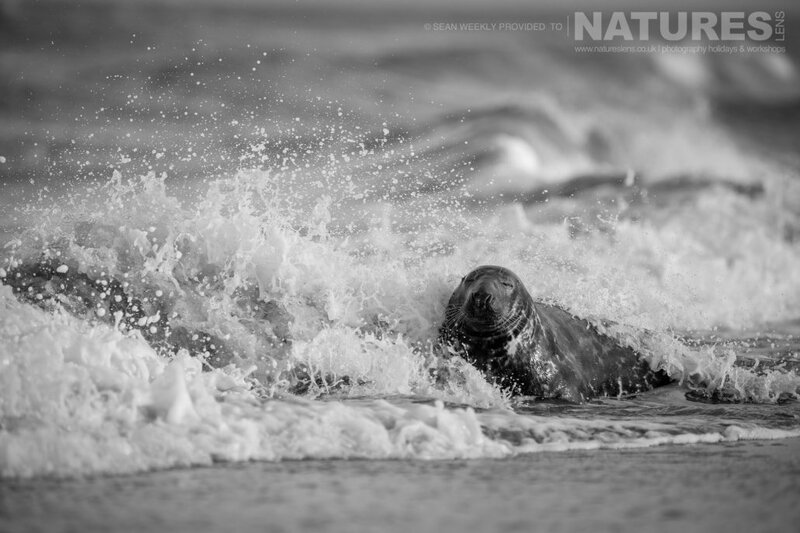 They were lucky enough to get some lovely shots of these iconic mammals swimming around, frolicking in the surf & curiously popping their heads up through the waves. 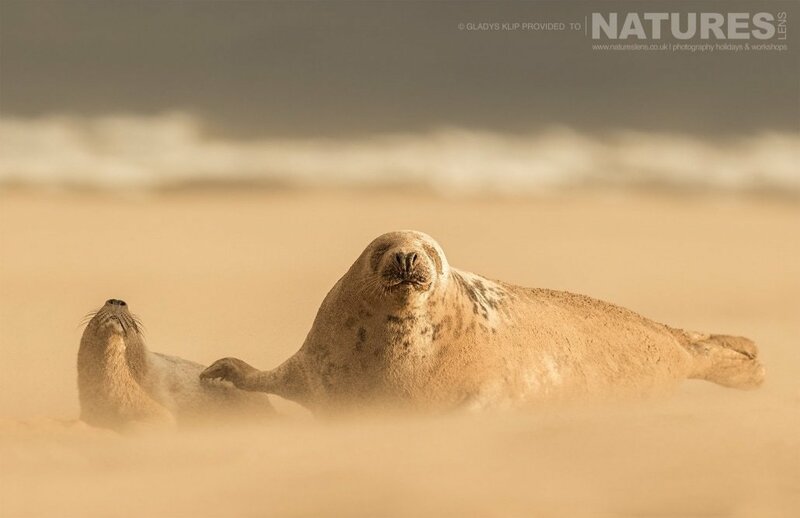 During our Seals of Lincolnshire photography holidays, the first group of guests experienced what can only be described as the most extreme weather conditions. From rainstorms to hailstones & sandstorms to rainbows. 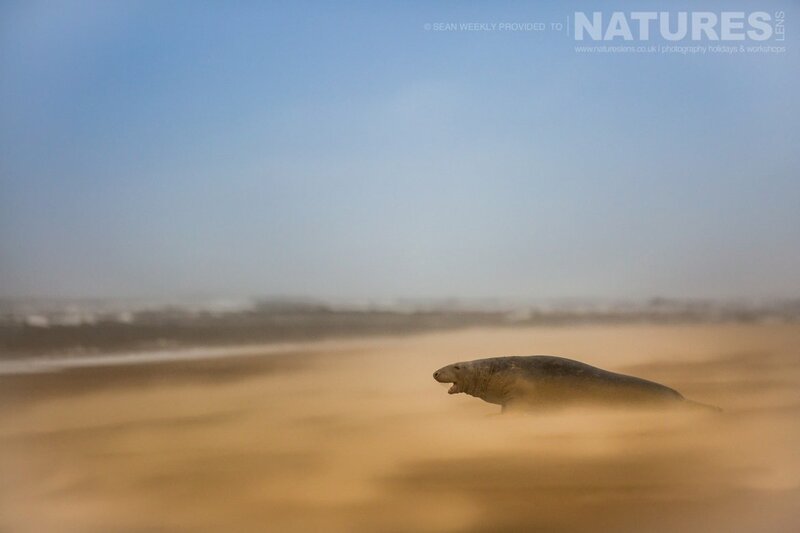 The conditions were harsh, but the opportunities presented by the ever-changing weather were completely epic as evidenced by the images in this blog post. Over the course of the two weeks of our Seals of Lincolnshire photography holidays, our guests were blessed with some excellent light. This gave Sean the opportunity to show them how to produce some creative imagery using the light for side-lit, front-lit & back-lit portraits. 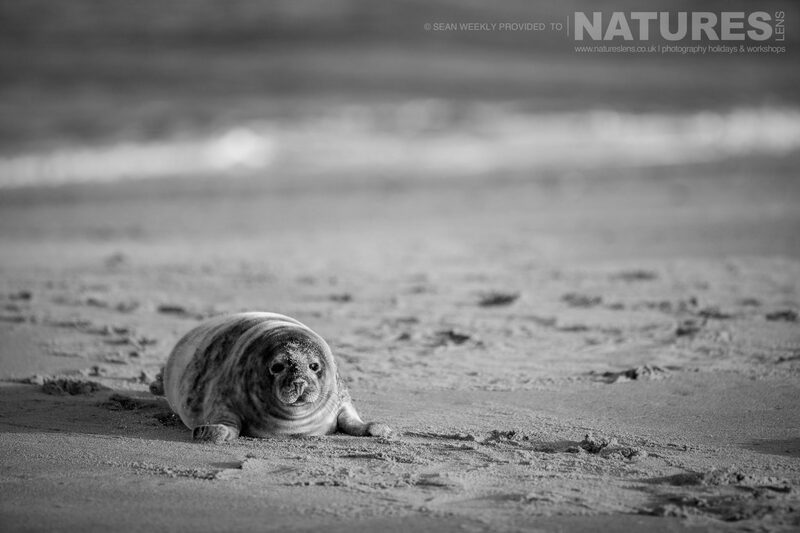 Do seal images work in black & white? 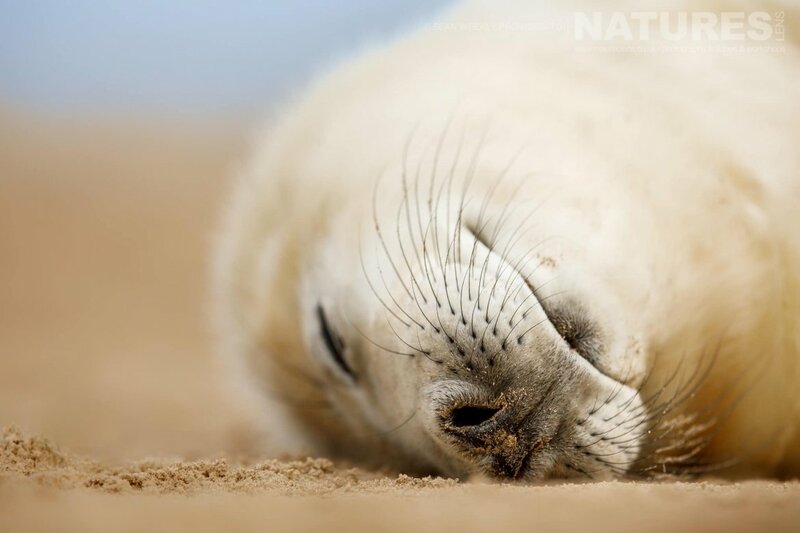 Judging from the photos taken by Sean while guiding our Seals of Lincolnshire photography holidays, I’d say an emphatic yes! 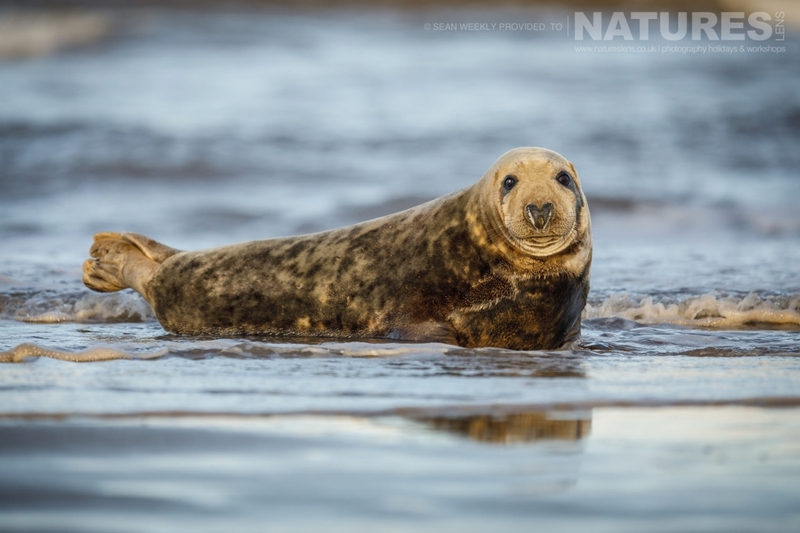 During November I spent two weeks guiding the NaturesLens Grey Seal photography holidays. 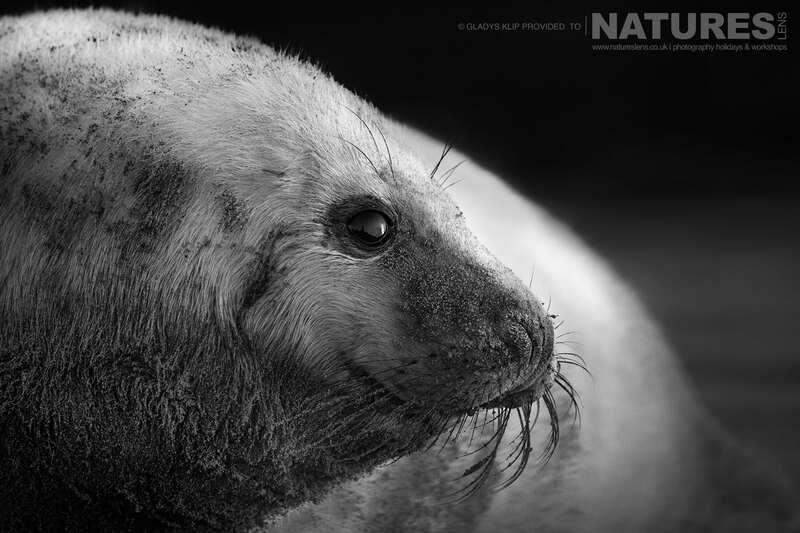 The Grey Seal is one of Britain’s most charming mammals & my personal favourite subject to photograph so to spend this amount of time with them was an enormous privilege! 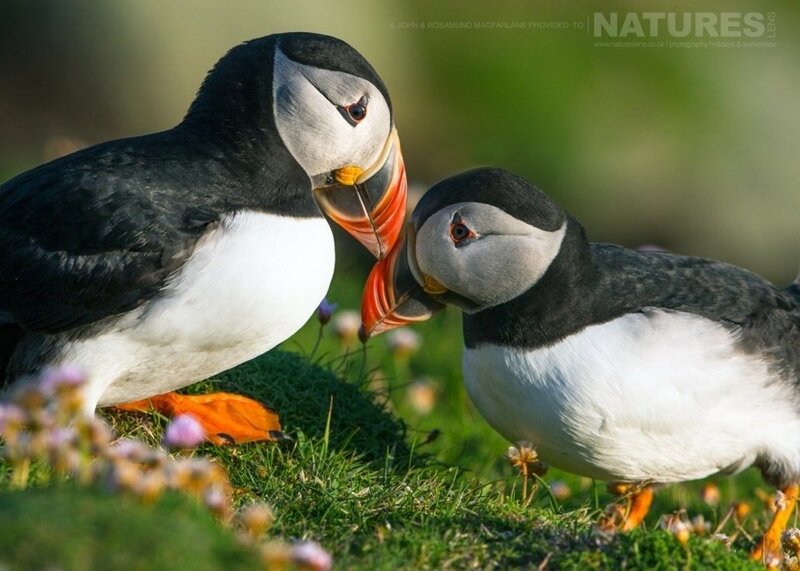 With just under half of their global population inhabiting the UK, their curious nature & cuddly appearance makes these animals fascinating to watch let alone photograph. 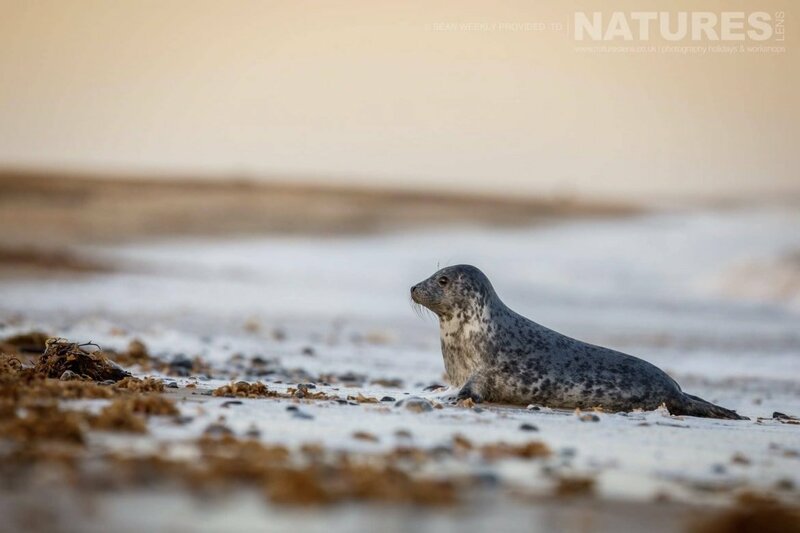 This pair of Grey Seal photography trips started off at a beautiful fully-equipped cottage with the private beach being a stone’s throw away from the seals. 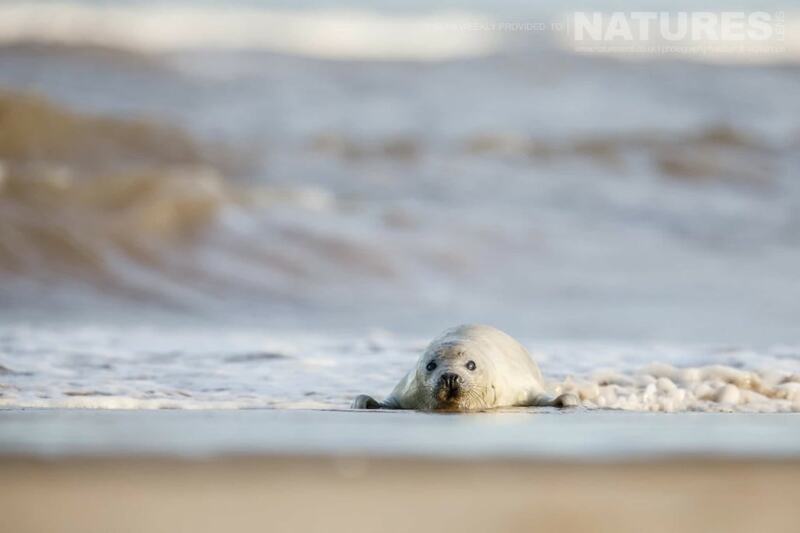 Once the group & I had settled in, we kitted up in our waterproofs & boots & headed to the beach for our first session with the Seals. 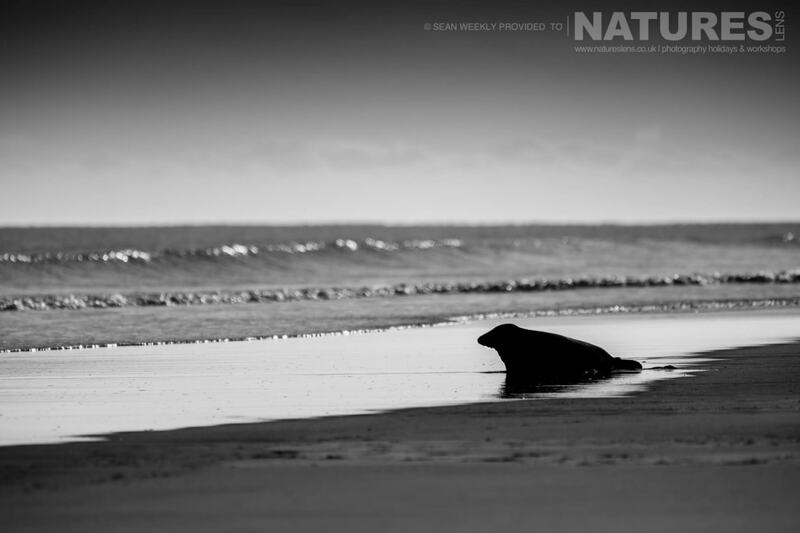 It was low tide, so we were able to venture straight out to the sandbanks where some of the seal colony stayed. 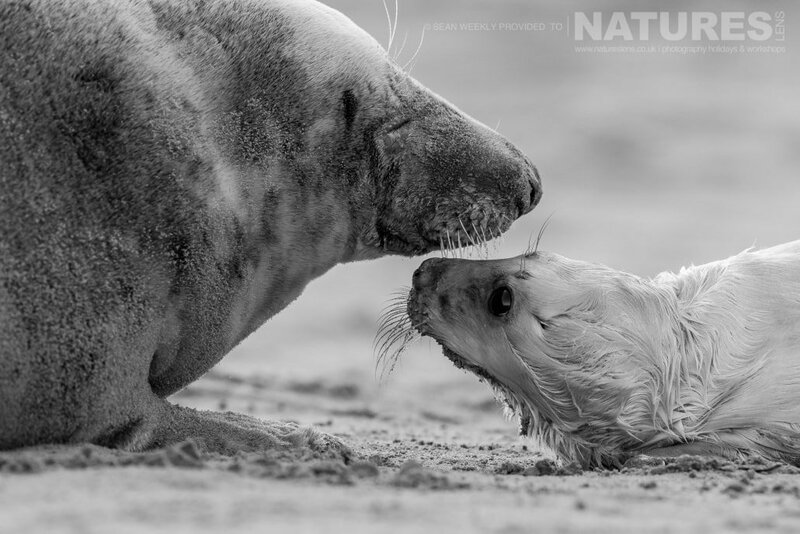 Are you may have seen elsewhere, we have launched the follow-up to the 2017 week-long seal photography holiday – that, it has to be said, produced some beautiful imagery – with a week-long seal photography holiday in Norfolk, our first event, for Norfolk Seal Photography is to be conducted in November 2018, specifically November 25 – November 30 2018 & costs £999. Sean recently spent several days in the area that the Norfolk Seal photography events will be conducted within, & we thought that you might be interested to see some of the types of imagery that he captured during his brief recce trip for us. 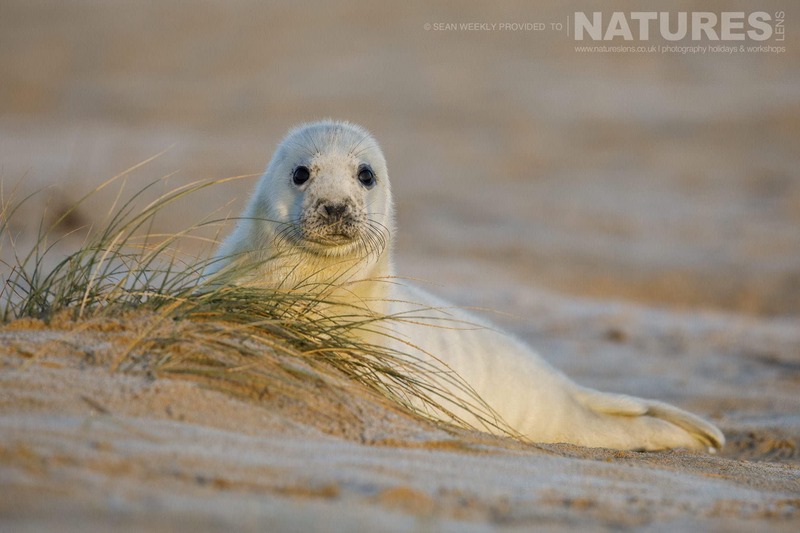 In November 2018, Sean will be leading a week-long holiday focussed on Norfolk Seal photography for NaturesLens, specifically between the dates of November 25 – 30 2018. 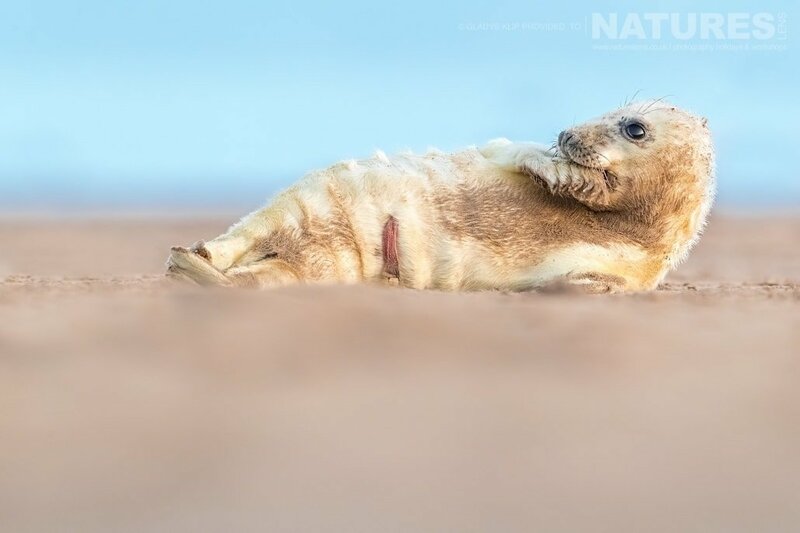 The cost is £999 per participant which includes five nights accommodation in a gorgeous cottage on a dinner, bed & breakfast basis; your meals will be warming, homely & plentiful to get you warmed through & filled up after a long day on the beach. 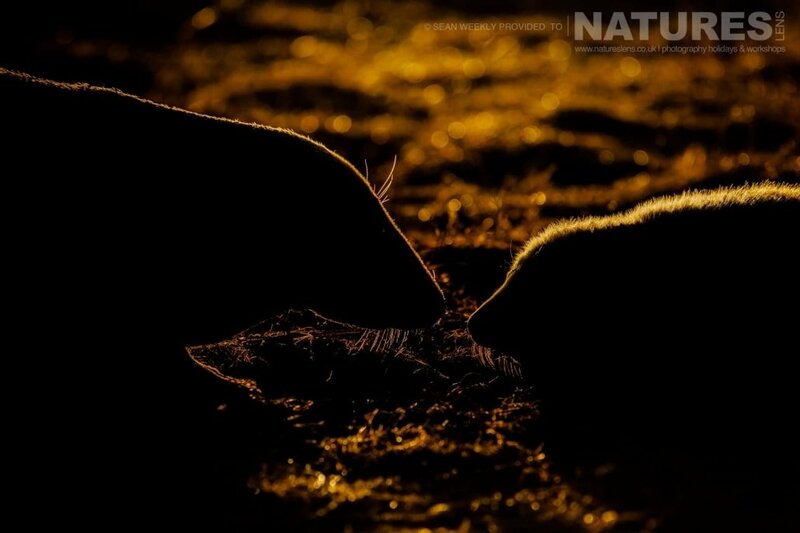 Numbers are limited to ensure that the trip is sustainable, ethical & enjoyable for every photographer. 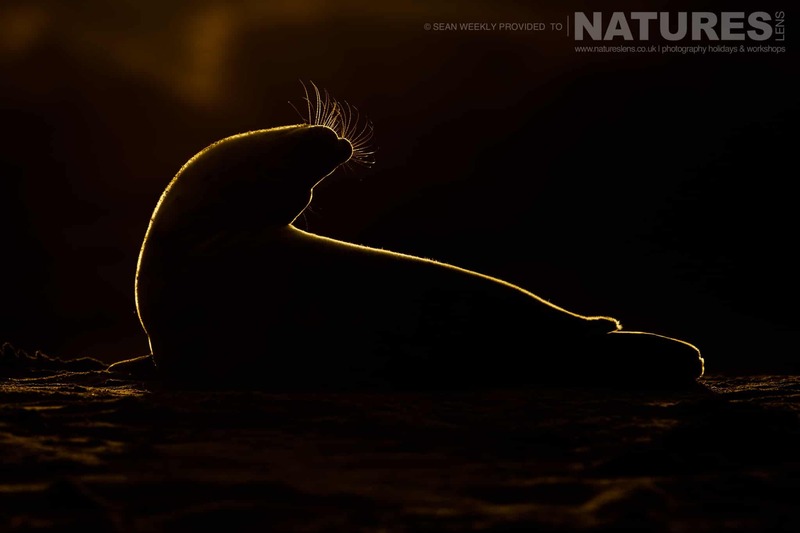 November 2017 saw Gladys joining one of the NaturesLens Seal Photography tours, the intent, to spend a week intensively capturing images of the Seals of Lincolnshire coastline in all lighting & weather conditions, under the guidance of Sean, who led the trips for us & offered mentoring & advice. 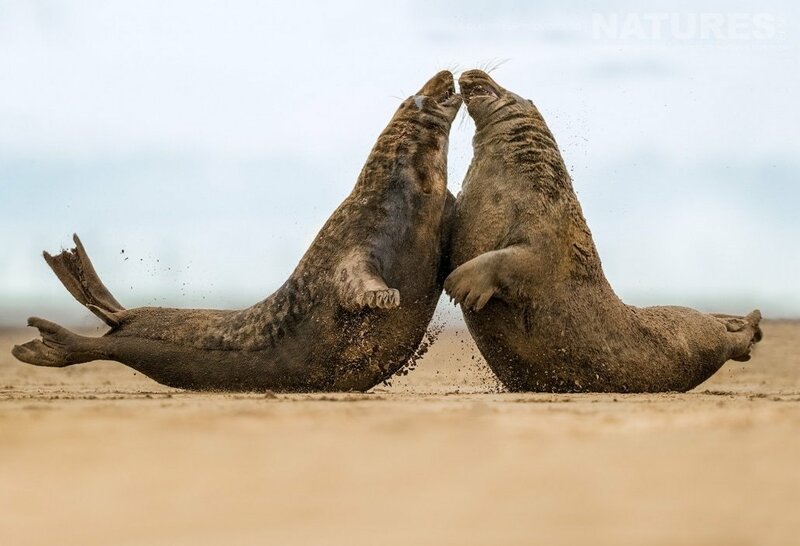 The group experienced all types of behaviour throughout the week of seal photography, but apparently the most daunting & loud was when this pair of bull seals decided to face-off & fight each other. 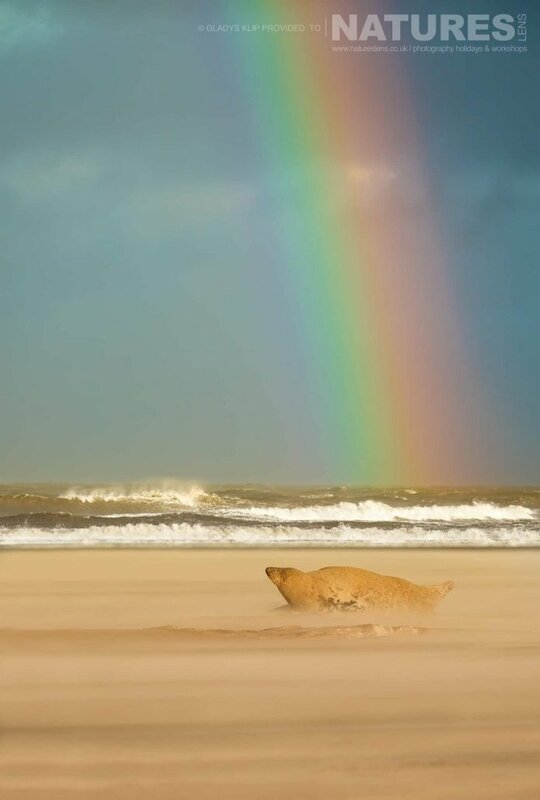 As Gladys describes it ‘An Awesome Moment‘, which is fitting for what happens when you have the opportunity to capture an image of your target subject with a rainbow in the background! The group were very lucky with the ideal weather conditions throughout the week which resulted in lovely colors. However, in the case of this image, Gladys couldn’t resist processing it to monochrome. 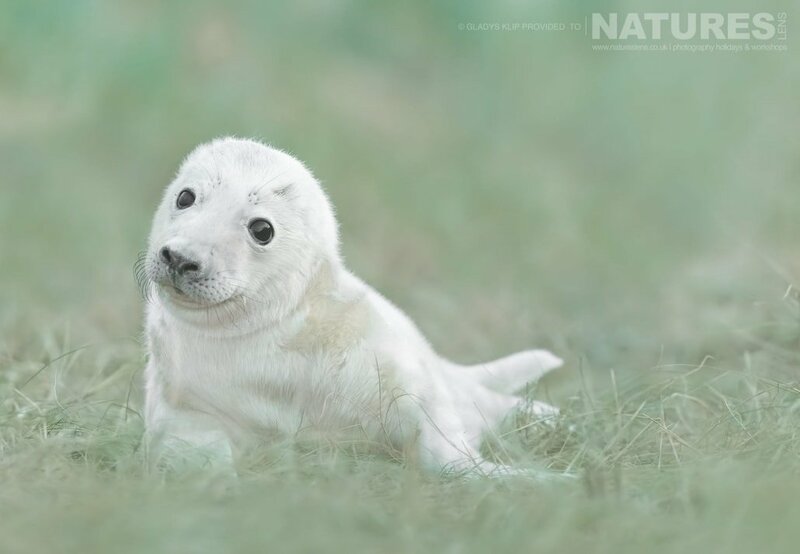 On the first morning, the group found this lovely pup in beautiful morning light, Gladys states that she was amazed to see that a part of the umbilical cord was still attached, which appears to be a very common thing even when the pups where already a few days old. 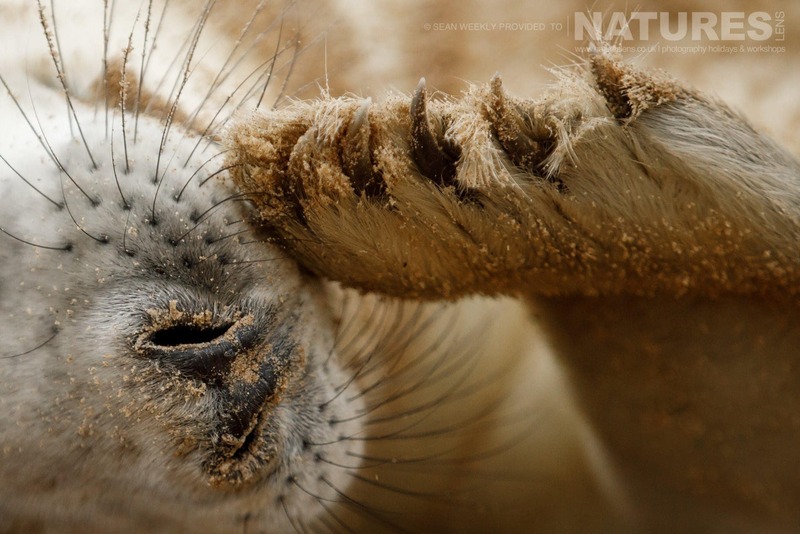 Without a doubt this was the group’s favourite seal pup! 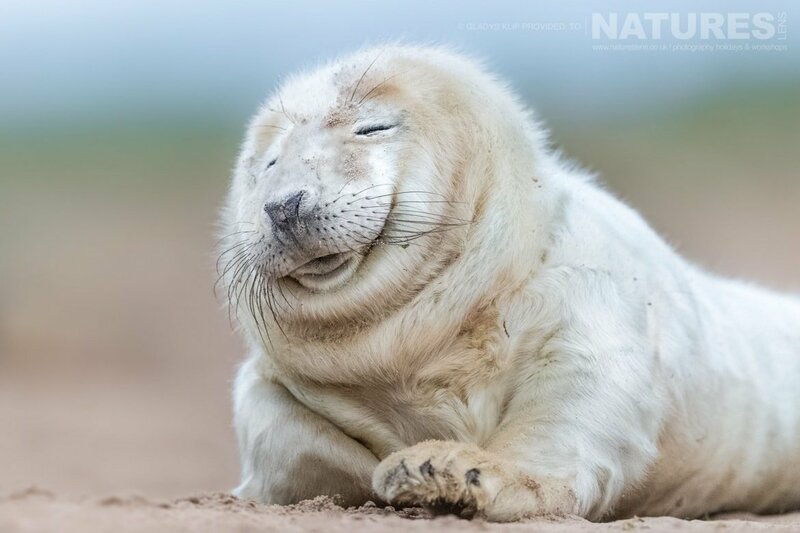 They nicknamed him ‘Chubba’, & every day they looked out for him as he demonstrated funny behaviour which caused the whole group much amusement! In addition to the photography on the beaches & at the surfs edge, sometimes the seal pups made their way up to the dunes, which as Gladys says, gave a nice change of setting, for seal photography in the green grass areas. 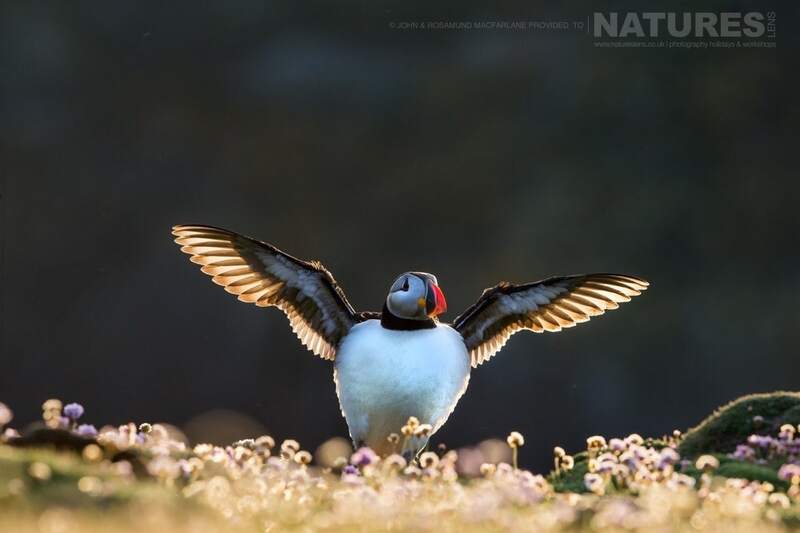 One afternoon, the group experienced some extreme weather conditions, everyone commented that it was very difficult to photograph under these circumstances; but they persevered & managed to get some extraordinary images. 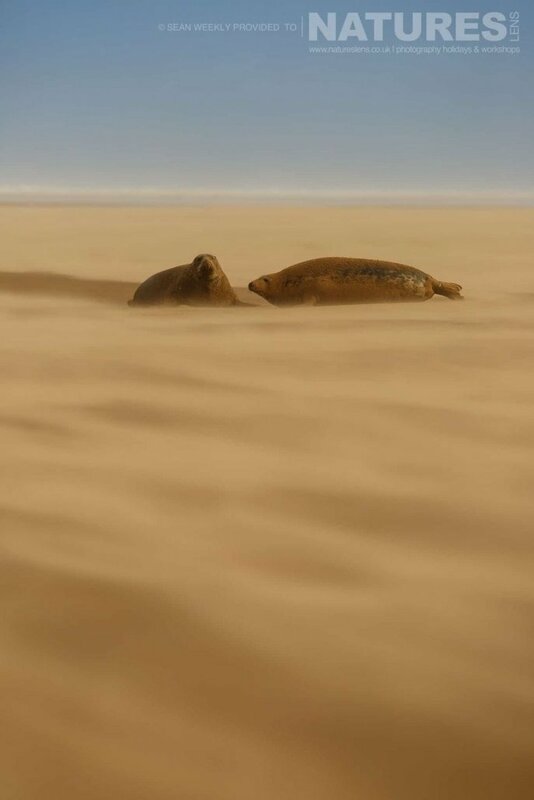 This female seal was reaching out to her pup to make sure it was still laying next to her as it was impossible to see in the sand storm. 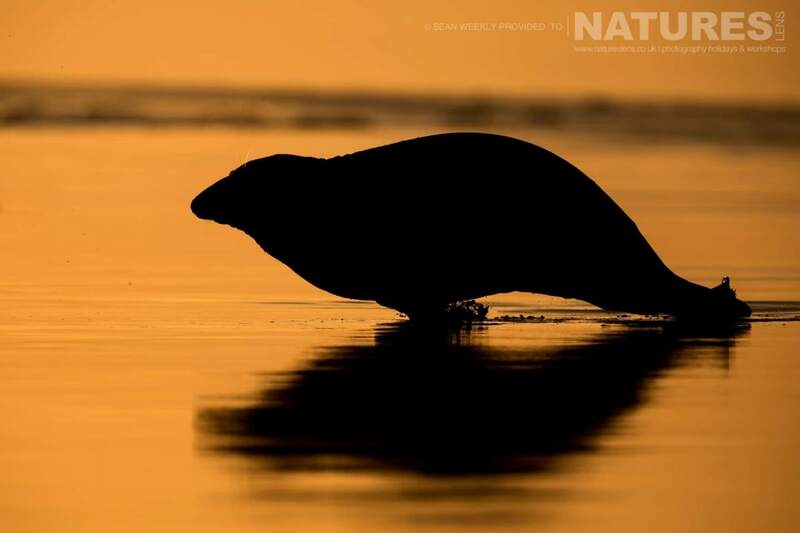 In November 2018, Sean will be leading a 5-night-long wildlife photography holiday focussed on Seal photography, but this time in Norfolk for NaturesLens, specifically between the dates of November 25 – 30 2018. The cost is £999 per participant which includes 5 nights accommodation in a gorgeous cottage on a dinner, bed & breakfast basis, your meals will be warming, homely & plentiful to get you warmed through & filled up after a long day on the beach. 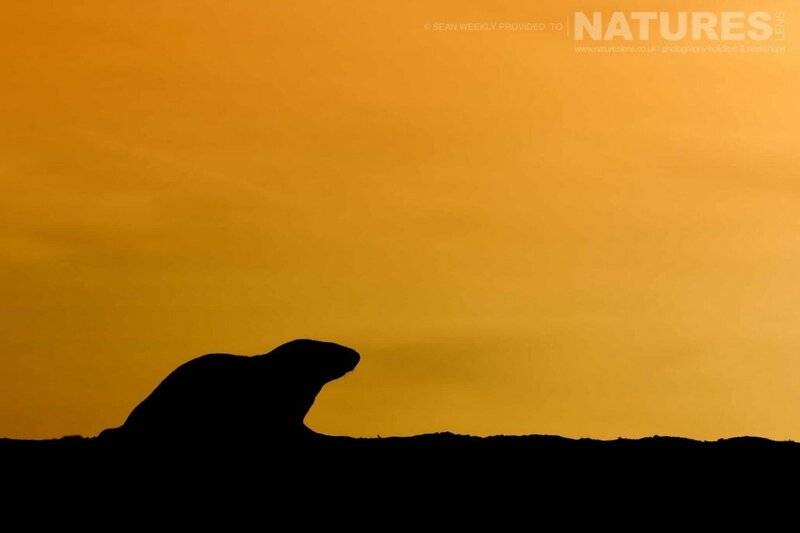 Numbers are limited to ensure that the trip is sustainable, ethical & enjoyable for every photographer. 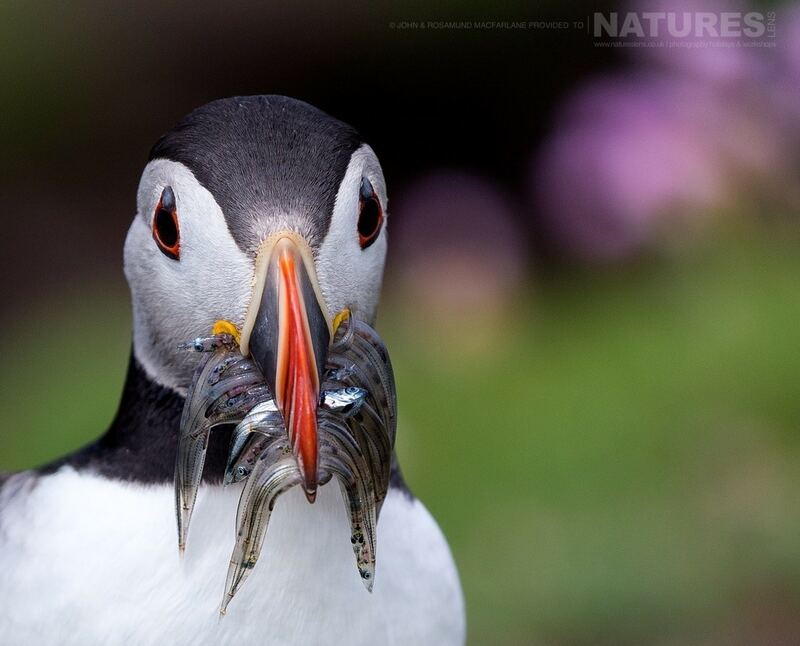 John & Rosamund were just 2 of our guests on this year’s trip to Fair Isle to photograph the iconic Atlantic Puffin. 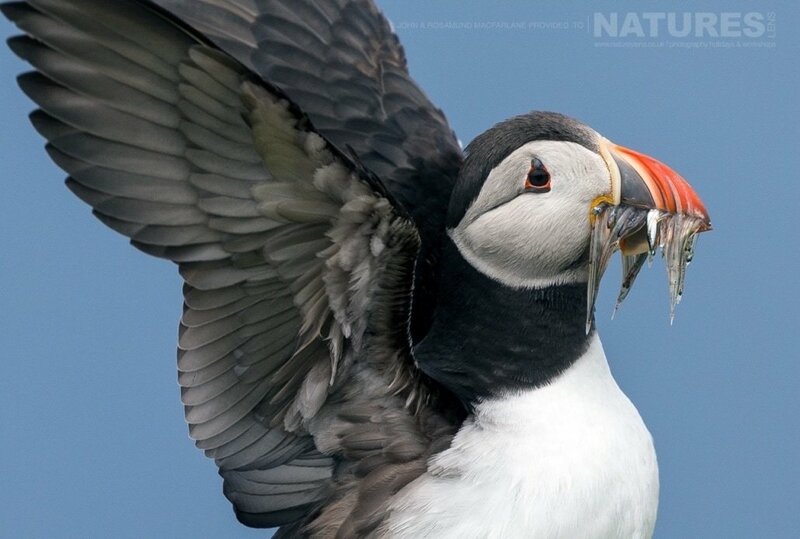 They were blessed with nearly perfect weather for the entirety of their trip which enabled them to get some fabulous images of the comical clowns of the sea. 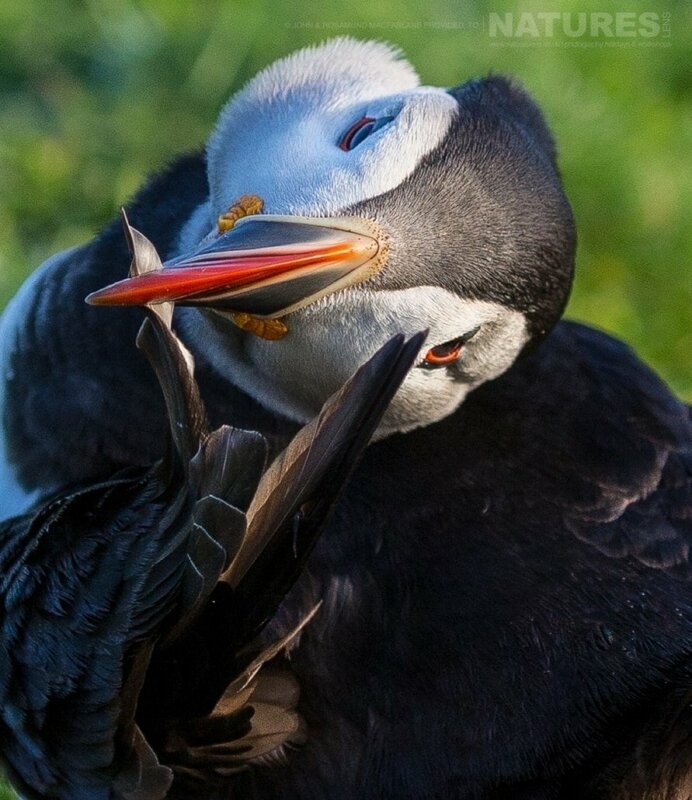 I absolutely love this puffin preening shot. 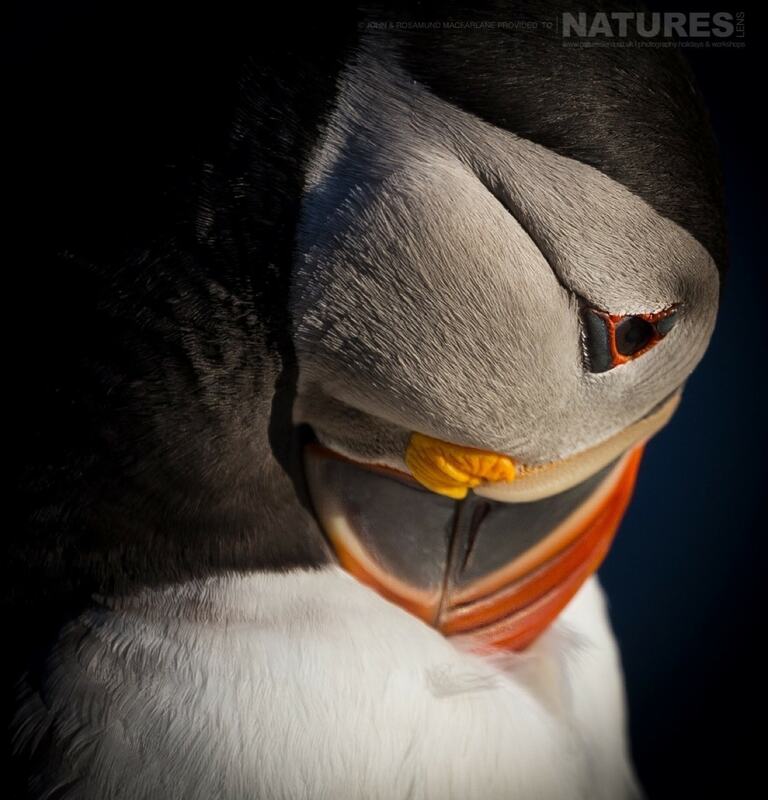 Simply stunning & my favourite image from all the ones that they kindly sent in for us to share. 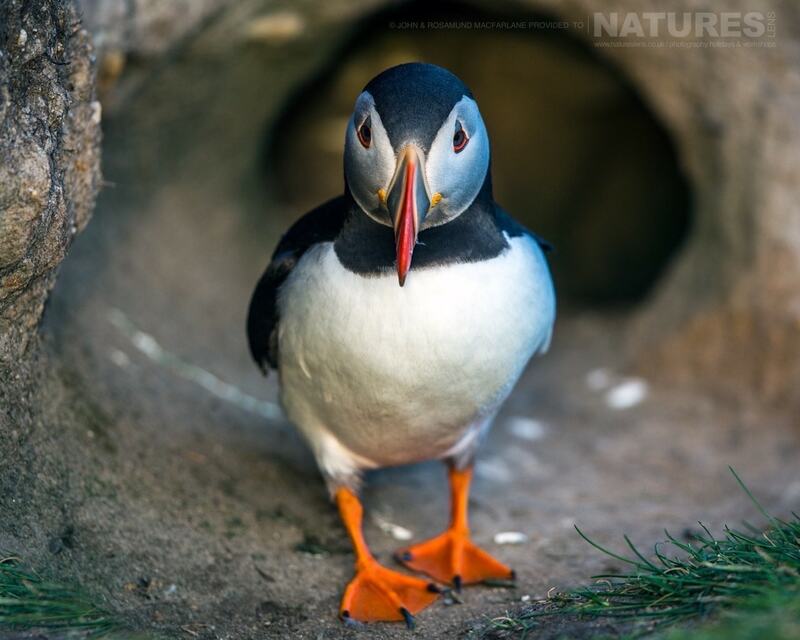 WHY NOT PHOTOGRAPH THE SHETLAND PUFFINS FOR YOURSELF? 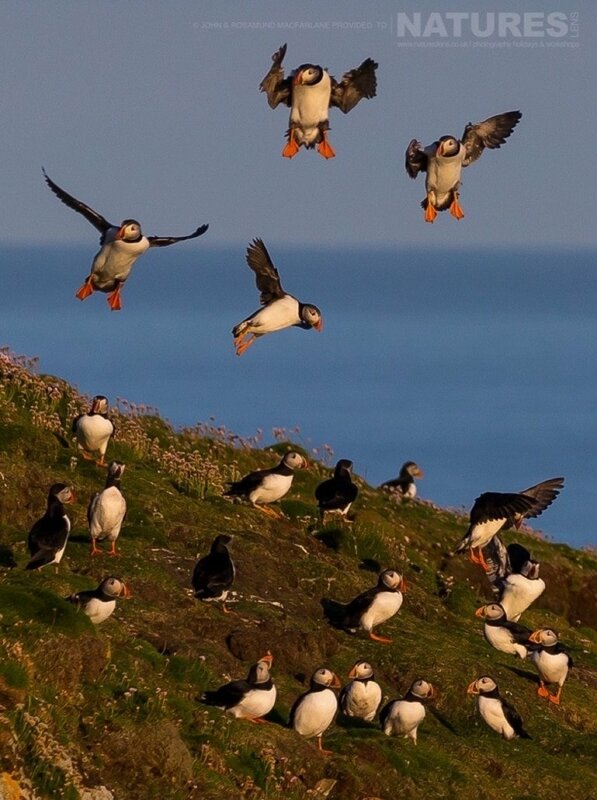 If you would like to photograph the brilliant & comical Puffins of Fair Isle, which Kevin will be again leading in 2018, then you can book the 2018 Puffins Of Fair Isle for £1199. This is a great trip & will fill up fast so don’t miss out. The trip is scheduled to run between the dates of June 14 – 19, 2018. 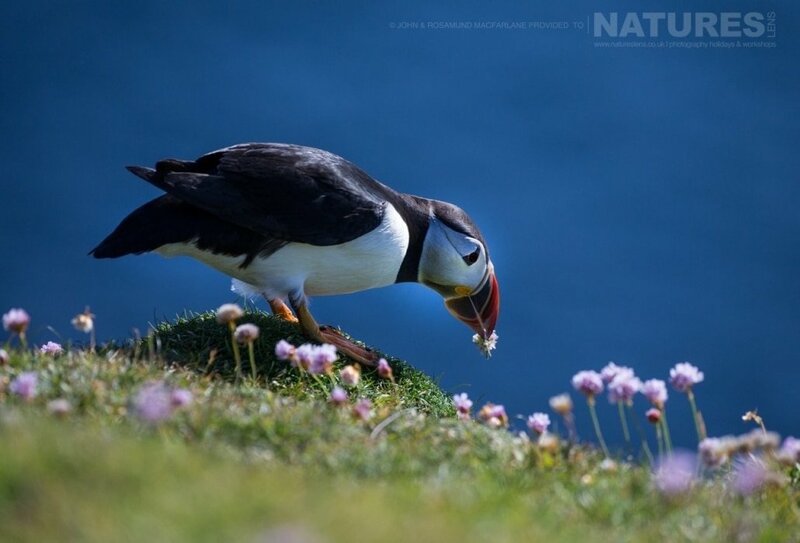 We include all accommodation on Fair Isle which is a full board basis, flight from Sumburgh to Fair Isle & ferry back from the island to Sumburgh. 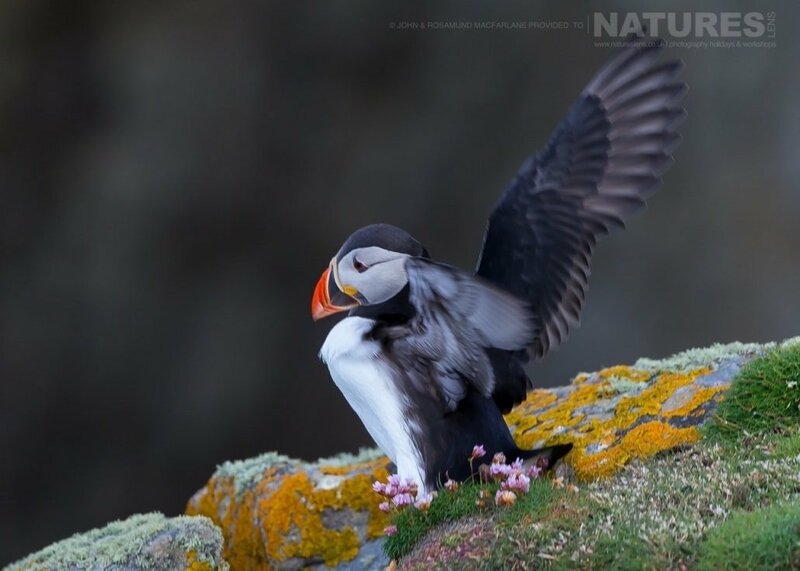 The itinerary is flexible between puffin sessions to allow us to photograph other species of birds, including Arctic & Great Skuas, Fulmar & other seabirds or if you wish you can head off on your own & explore the island. 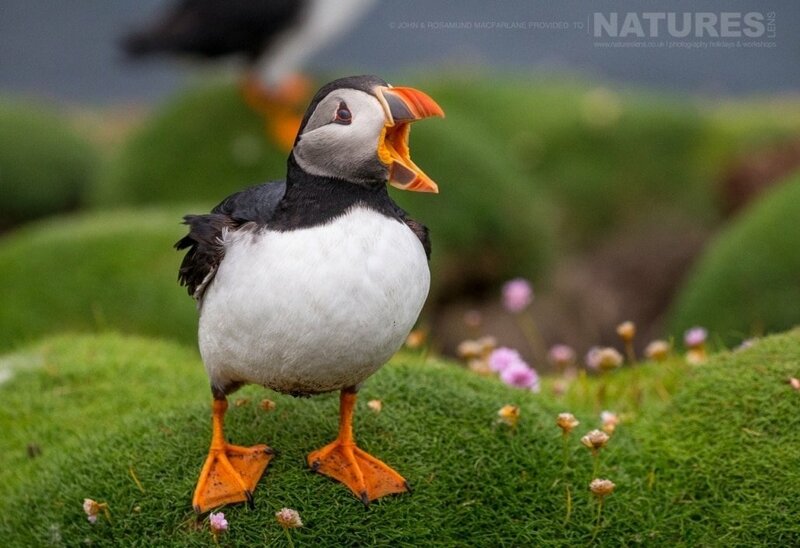 Whatever your query regarding our photography holiday, John & Rosamund’s Shetland Puffins, please fill out your details below & we will get back to you.